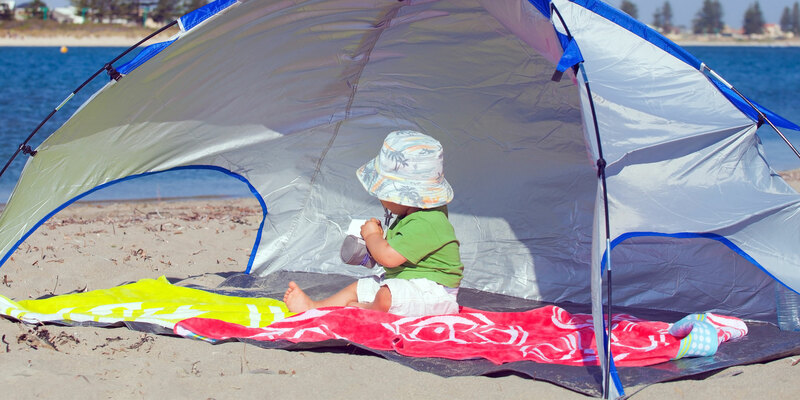 Beach tents are a summertime necessity for babies. These are our picks for the best beach tents for babies. The Baby Beach Tent is a pop-up tent that collapses nicely into a carry bag for transport to and from the beach. It offers 50 SPF protection with the special silver-coated fabric, and the fabric “floor” is nice to keep the sand away, too. Included pegs make it easy to secure into the sand. There is even a small pocket inside that can hold a phone or diapers. This beach tent can easily fit two children or one adult. The whole family can fit under the EasyGo Cabana beach tent, as it is more than 5 feet tall and more than 6 feet wide. At least four adults can sit comfortably underneath when seeking protection from the sun. This lightweight tent folds nicely into a tube-like carrying case, making it easy to transport and set up once you arrive at the beach. Families don’t need to worry about this beach tent blowing away, either, as its patented design features corner pockets that you fill with sand to secure it in place. The portable Tagvo Pop Up Beach Tent is nice because it offers three large screen windows in the rear that can be opened to enjoy a cool ocean breeze or closed for nap time. 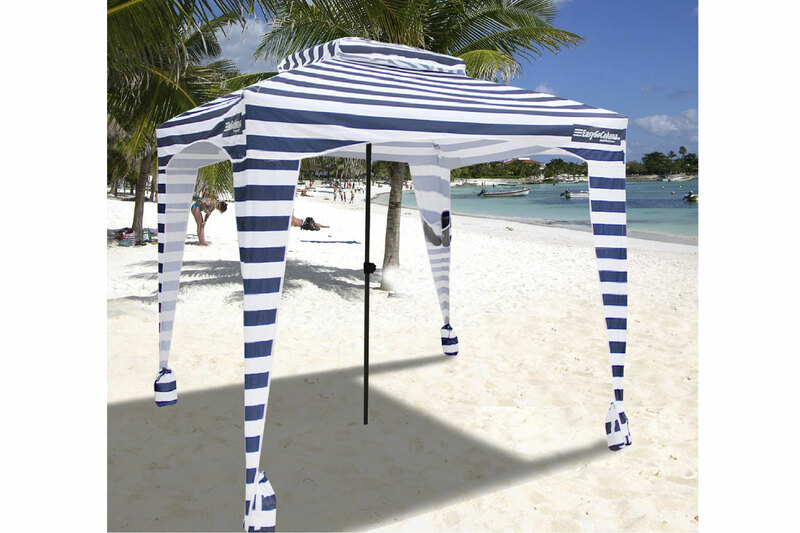 This beach tent shields from 50+ UV protection and can be set up or collapsed by one person. Steel stakes and sand pockets are included to secure it from the wind and there are mesh pockets inside that can fit an iPad, phone, keys or small toys. 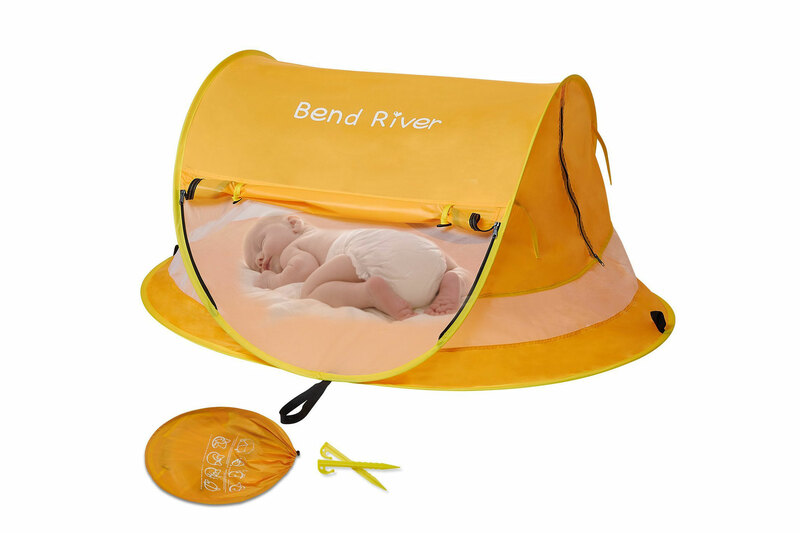 Shield your baby from the sun and bugs with the Bend River Baby Portable Beach Tent. It’s breathable on all sides, with mesh fabric so your child is easy to see, and lightweight toys can hang from the top to entertain baby at the beach. It also has multiple zipper openings for convenience, and UPF 50+. Two tent pegs are included to secure it in the sand, and it collapses into a small carrying case. This beach tent for babies provides 50+ UPF protection, but also gives your toddler his or her own personal pool if you so desire! The Sunba Youth Baby Beach Tent is for children 3 and younger, and on the floor of the beach tent is a mini pool that can be filled with water so baby can splash and play. But if the mini pool doesn’t appeal to you, don’t worry — the floor of the tent lays flat when there is no water in the pool portion. There are two side pockets inside and a zipper window with a screen to create a cross breeze. The baby beach tent collapses nicely into a small carrying case, perfect for transporting to the beach. We like the Babymoov Anti-UV Tent because it folds or unfolds in seconds, the anti-UV fabric is 50 SPF, and the added mesh roll-up at the front protects kids from bugs but allows for ventilation, too. The Babymoov is also nice because it is not as wide as other tents (taking up less space), but offers a deeper area inside the tent, which is great as kids grow. There is also a lifetime warranty! The Otentik Beach SunShade comes in a large variety of colors and three different sizes with the small fitting two adults and the large fitting up to seven adults. So the Otentik offers families plenty of space under the sunshade. Depending on the size, it weighs between four and five pounds and collapses into a tube-like carrying case. The two adjustable poles make it easy to adjust the height and angles of the tent as the sun moves throughout the day and offers UPF 50. Ropes and four reinforced sandbags also come with this beach tent for families so it can be securely fastened into the sand even on a windy beach day.